INTENSOL OLI is a compound which can be applied for cleaning any kind of machinery after all dyeing processes. The particular feature of INTENSOL OLI is that it contains substances that dissolve anionic and cationic precipitations depositing in machines and holds them in dispersion by means of precipitation inhibitors. These deposits may consist of hardeners, oligomers, preparations, auxiliary residues in mixture with dyestuffs. They cannot be dissolved in the machine, and are often not sufficiently saponified by caustic soda. INTENSOL OLI catalyses the saponification of oligomers in presence of caustic soda at temperatures between 80 °C and 130 °C during the cleaning process at the boil. 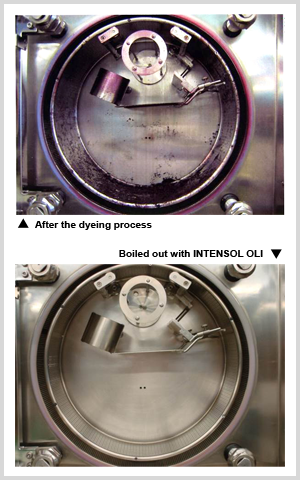 As a consequence, INTENSOL OLI is not only applied in cleaning processes at the boil but can also be applied after the polyester dyeing in the reductive aftertreatment at 70 – 80 °C for saponifying oligomers. INTENSOL OLI is very versatile and can therefore be used for removing oligomers during the reductive aftertreatment and for cleaning machines at the boil. INTENSOL OLI has an ideal foam concept. Whereas the disturbing foam development does not occur in the reductive aftertreatment, there is enough foam during the cleaning process at the boil, so that the boiling liquor can reach even hardly accessible areas in the complete machine. Due to the chemical composition INTENSOL OLI can be easily combined with REDULIT GIN in the reductive aftertreatment. When using INTENSOL OLI during the reductive aftertreatment the washfastnesses on polyester microfibers can be improved by up to one grade. Moreover, INTENSOL OLI can be combined with caustic soda to remove silicone stains on cotton, polyester or Polyamide. INTENSOL OLI is bluesign® listed. As a true all-rounder, INTENSOL OLI enormously improves the colour fastnesses of polyester microfibers dyeings, and simultaneously removes disturbing deposits from the machine walls. After application of INTENSOL OLI, the critical fastnesses of PES microfibre dyeings can even be improved by one grade and it is possible to strongly reduce the effort required for machine cleaning. Not only water and energy can be saved, but also up to 50 % of time. 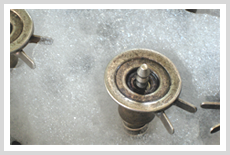 The useful "two-in-one" product is ideal for the separate cleaning of machines at the boil after all dyeing processes. Double power for your reductive aftercleaning.